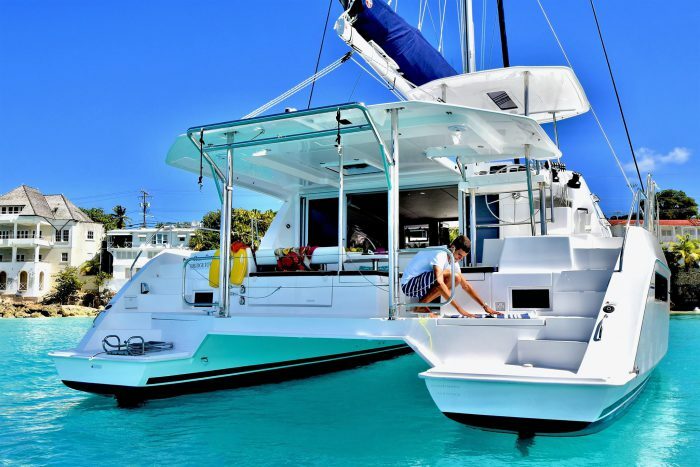 Ocean Daze is a brand new open design, luxury-styled 40’ Leopard catamaran offering friendly personalised service with a maximum of just 12 guests. Experience the crystal clear turquoise waters of Barbados, pristine bays & pink sandy beaches while you relax on board with Captain Ben & his crew. Customise your experience by selecting either the Breakfast & Lunch Cruise, a Simply Sunset Sail, or a Private and Luxury Cruise. The 5 hour Breakfast and Lunch Cruise begins at 9am. Cost is US$125 per adult, $95 per child 5-12 years old. Included are transfers, breakfast, lunch, dessert, premium bar offering blended cocktails, mixed drinks, sodas and juices, swimming with the turtles, non-motorised watersports, ending with complimentary entry to The Boatyard. The Simply Sunset Sail is from 2:30pm to 6:30pm. Cost is US$125.00 per adult – US$95.00 per child (5-12 years). Included are transfers and delectable hors d’oeuvres, fine wine or Prosecco. Anchor in an exotic bay and relax in the tranquility of nature. Gaze as the sun gently sets below the horizon giving way to the dusky sky, twinkling stars. Ocean Daze’s Private Cruises are perfect for a fun time with your friends where you can decide what you want to do. Cost is US$1,500.00 per cruise. A trip on Ocean Daze will be a truly unique Caribbean experience at sea with Captain Ben & his Crew.